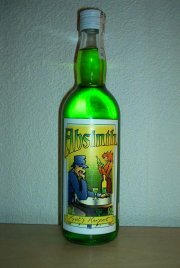 The only quite interesting thing about this one is that it was the only absinthe allowed in Denmark for a very long time. The story also has it that when one entered Kruts Karport, the bar, and ordered absinthe, they'd only serve you a maximum of two shots. You could go crazy, right? But apart from that little story, there's really nothing special to it. It's artificially colored and includes artificial aroma. A small label on the back tells it. The main label on the bottle is quite odd. It looks like something definitely home made, but yet with a touch of the 60's or something like that. Now, the drink itself. I've had worse, that's for sure. But I personally think it both smells and actually tastes a bit like butter caramel! There's virtually no taste of the bitter wormwood. For being so candy-like it's amazing that the anise is not more dominant than it is. But one can clearly taste that it's been sweetened. There is no form of herbal or floral character what so ever in this one and that makes me wonder why they charge so outrageously much for this. At a smashing 795 Danish Kroner you get to bring this bottle home from the bar. That is approximately $110! Overall I'd say that this is not worth the money. It's a nice thing that it's a bar making their own absinthe and all, but it could be so much better!